Perhaps the most famous magician in the world was Harry Houdini. Houdini's legendary escapes and bombastic personality put his stamp forever on the public perception of magic and magicians. Before Houdini, however, there was the man who put his stamp on Houdini's generation -- France's greatest magician, Jean Eugène Robert-Houdin. Born Jean Eugène Robert in the early 1800s, Houdin would later be added to his name after his first marriage. Young Erich Weiss, some 100 years later, would mistakenly think that Robert-Houdin was the magician's first and last name, and added the letter "i" to the end in belief that it would mean "like Houdin." Robert-Houdin was born to a famous watchmaker from Blois, and was sent to Orleans to study law as a young adult. His fascination with the mechanical and toy making, however, was better suited to his father's trade and so young Jean was sent packing. Determined to make something of his new career as a watchmaker, Jean purchased a set of books on horology. In a delicious twist of fate the bookseller accidentally gave him two volumes of scientific experiments, including the secrets behind many magic tricks. Jean was fascinated and immediately began to learn various sleight-of-hand techniques. He practiced them in secret so as not to be thought frivolous, and both his watchmaking skill and his skill as a magician grew thanks to the constant exercises in manual dexterity. 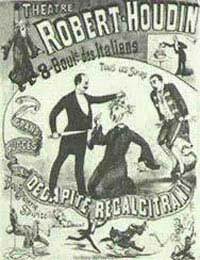 In his memoirs Robert-Houdin later wrote of an encounter with a traveling magician by the name of Torini, from whom he learned the basics of showmanship. At the age of 40 Robert-Houdin opened his very own theater but his first show bombed. He had forgotten the lessons Torini had taught him and moved through his tricks too mechanically. Over time he developed a sense of the audience and the proper way to perform magic. He recorded his discoveries in what would become the first playbook of the modern magician. This, along with his use of slick, deceptive, and technically perfect magical automation is what earned him the title Father of Modern Magic. Prior to opening his theater Robert-Houdin was well-known for his automatons, mechanical man and beast that would perform incredibly complex tasks due to the hidden mechanisms of the watchmaker craft. A crystal clock that kept perfect time but appeared to have no moving parts, for example, or birds that would sing despite being made of metal. Despite his shaky beginnings as a magician, Robert-Houdin became famous indeed. When the French government was having trouble with rebellious religious leaders in Algiers, they turned to Robert-Houdin as their own miracle maker for help. In a special showing for the tribal leaders, Robert-Houdin put his magic and modern science to the test in convincing Algerian miracle workers that French magic was superior. Using a powerful electromagnetic hidden in the stage, Robert-Houdin was able to make it appear as though he and sapped the strength of an audience member who could not lift a box that contained a hidden metal plate. Performing the bullet catch made it appear as though he were immune to gunfire and vanishing a member of the audience on stage as if he could disintegrate an opponent at will. The French Government code Robert-Houdin an enormous debt for his help, and magicians the world over to him and even greater one for his examples and philosophies concerning Magic.